The Conjuring House is clearly inspired by the great horror games that came before. 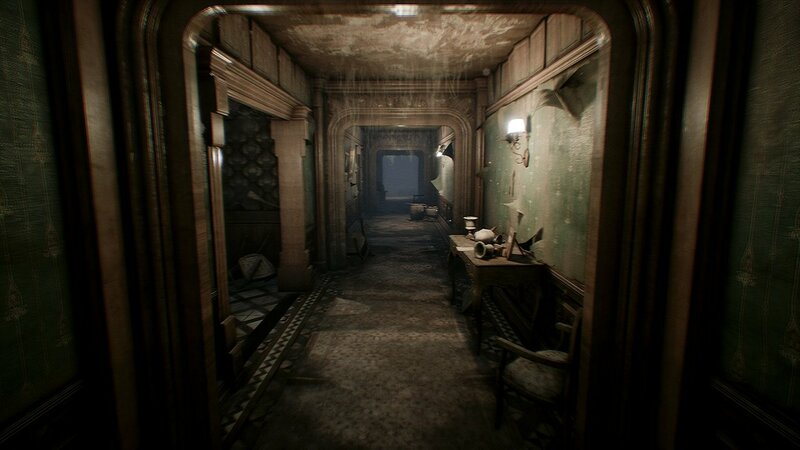 It borrows the run and hide style popularized by Outlast and Amnesia along with the mansion setting Resident Evil is known for. Unfortunately, The Conjuring House fails to take these elements and make them its own. It just makes me want to play one of those better games instead. The biggest fault of The Conjuring House is its generic and boring antagonist. It’s a spooky ghost that haunts the house and stalks the player. That’s it. The monster has no personality. The Baker family of Resident Evil 7 were so terrifying because you got to really know them throughout your time in the house. They were creepy because they felt real. This element of horror is completely lost in The Conjuring House which makes the randomly appearing ghost nothing more than a nuisance. This is then compounded by forcing you to return to one of the safe rooms to get the ghost off your back. There is no other way to lose the ghost. That’s the appropriate response to a dead body. Speaking of safe rooms, these also serve as your only way to save the game. This is incredibly obnoxious with the style of game. You see, The Conjuring House is really just one big, spooky scavenger hunt. You have to find a myriad of keys, flashlight batteries, artifacts, and other objects. Some of these items, namely numbers for a padlock, spawn randomly. Dying due to the randomly spawning ghost before you can save means losing already gathered items and potentially having them spawn in a totally new location. An autosave after key points would solve this and at least stop me from having to re-watch cutscenes. A little more information would also be appreciated. I grabbed one of the artifacts you have to destroy to defeat the ghost but the game failed to tell me I couldn’t get to a safe room to save until I already ran to one. This caused me to die and have to repeat the entire section. The only thing scary about that is how poorly it was thought out. Another odd design choice is how you access your tasks. Hitting tab brings up a general list of things you need to get done and then hitting enter brings up a more detailed list of what you need and what you have. So to get the full list, you have to hold tab and enter at the same time and this doesn’t pause the game at all. This is bizarre and uncomfortable when all I want to do is see which padlock numbers I have found. The Conjuring House also suffers from the same problem Outlast does; it forgets that less is more when it comes to horror. I don’t need a ghost in my face every 10 minutes. I don’t need to see the main character getting batted around like a cat with its favorite toy. I don’t need boring cliches like a room where everything is covered up and uncovering them reveals a ghost. There is a big difference between being startled, and being scared. I was startled when a ghost popped out unexpectedly, but not scared. It lasted but a moment and then I immediately rolled my eyes from how boring and generic it was. True horror is slow. True horror has you watching your back and jumping from every innocuous sound. True horror has you thinking about it even when the game is off. True horror is not showing what the ghost looks like in the first fifteen minutes and then never having them leave you alone. A monster is immediately less terrifying the moment you know what it looks like. The atmosphere is pretty good, but it is poorly utilized. Unfortunately, the most terrifying thing in The Conjuring House is how bad it runs. The game repeatedly jumped between 80-20 FPS and this jitter was constant and annoying. The mansion is comprised mostly of small, narrow hallways and yet the textures pop in and out like they are haunted. The main protagonist’s voice acting is terrible. It isn’t the goofy terrible of Resident Evil 7 which provides a smile in a haunted environment. It is the bad voice acting that takes you out of the environment and makes a game already lacking in scares even less spooky. The Conjuring House takes parts and pieces from other horror games but fails to add anything new. The in-your-face ghost and technical issues stop whatever scares the game could offer. At the end of the day, The Conjuring House is nothing more than a scavenger hunt in the frame of a generic ghost story that lacks creativity and scares.